Since 1978 this boat has been whisking sailors through the seas and oceans of our planet. It has held a strict course over ground and even won a race or 2 in her time. I'm told it was an Atlantic crossing non the less. I won't go too much further into the boats exploits as after all, I'm here to sand it and restore to it's original finesse. 1 thing that really does stand out here is the fact that smart phone cameras are not up to the job (soon to be rectified)!! The traditionally built framing is still very sturdy and in good nick, so it is just a case of seeing to the asthetics of the furniture to my relief. 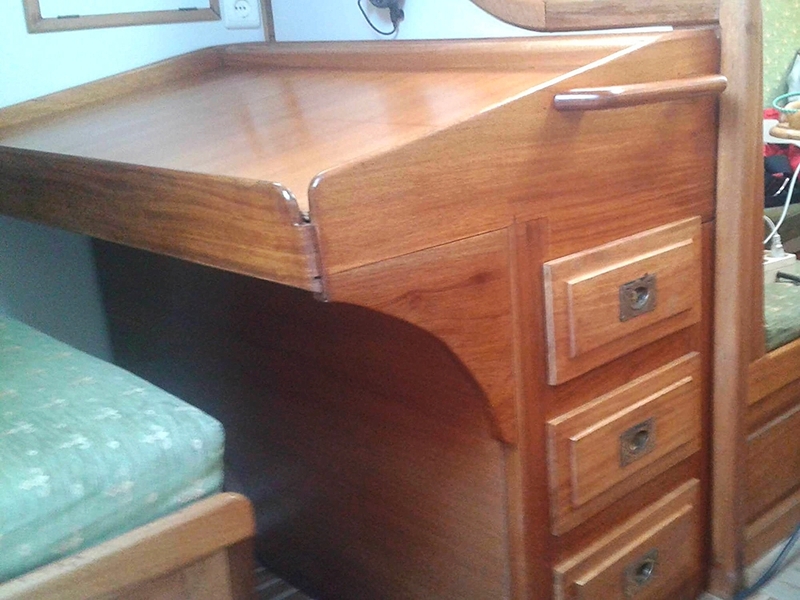 Along with this piece and the other parts of the interior teak work the work entailed was pretty much the same appart from the very worn areas receiving an extra top coat to keep a regular patina throughout.